My, oh, my! See our Archadeck design award winning porch and deck design in Great Hills! 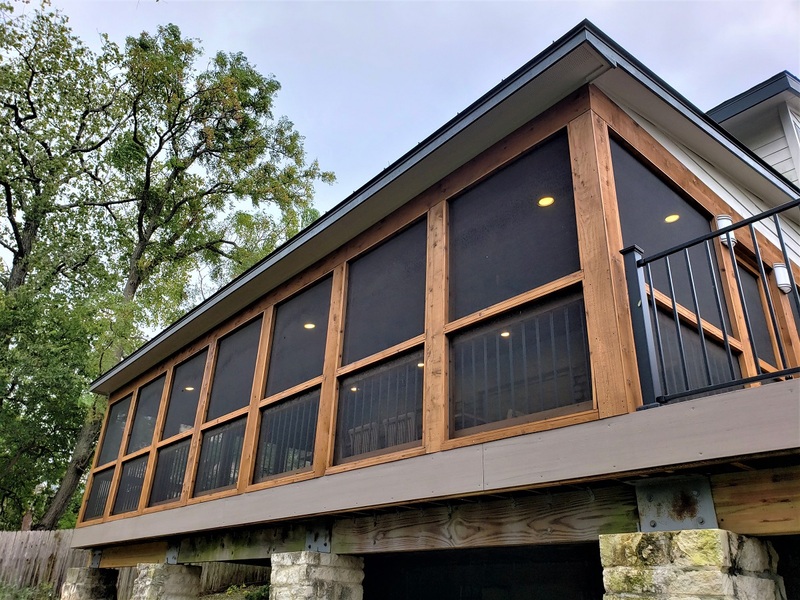 Archadeck of Austin transformed this Austin deck, having never lived up to its full potential, into one amazing screened porch and deck outdoor living combination. 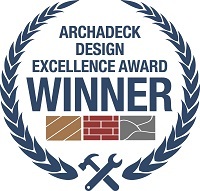 See why this outdoor living design is an Archadeck design award winner! Oftentimes, we are engaged by new clients, who have an outdoor living area that is just not meeting the intended need. Such was the case with these Great Hills clients, who had hoped for so much more use of their outdoor living area. What was meant to become a beautiful, expansive Ipe deck, had turned into a bedraggled structure in need of a major overhaul. 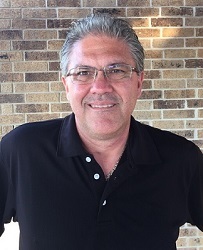 Archadeck of Austin joined the homeowners in identifying their outdoor living needs and design requirements. Together, we brought their outdoor living to the next level, creating a truly custom space that will serve them and their guests for many years to come. 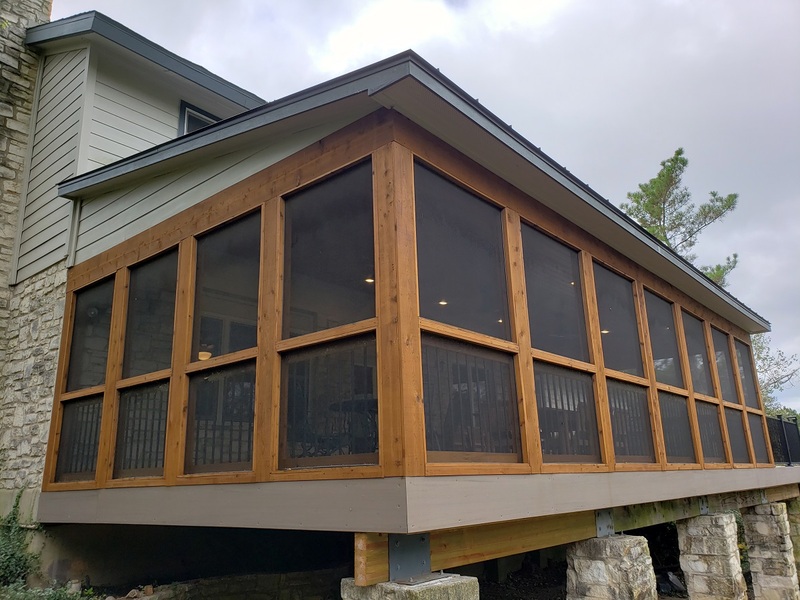 — Custom cedar framed screened porch in Austin, TX. 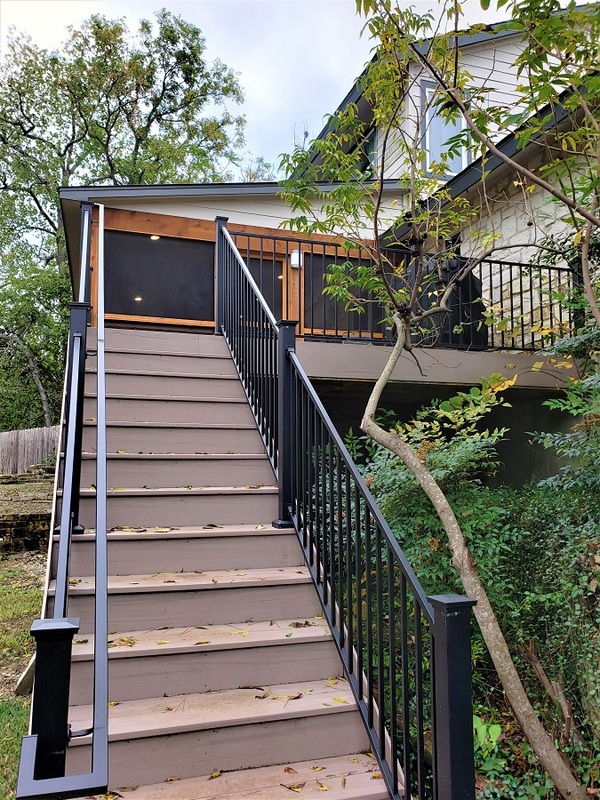 These Austin homeowners had hoped year after year to bring their wood deck and stairs up to snuff. With little time to make repairs and necessary finishes, they conceded the job was too far off-course to complete. We removed the aged balcony and accompanying doors, framed up the space for new windows, and a second contractor came in to install the windows. The siding was also replaced in that area. Any portion of deck framing that was salvageable, was kept in place and reinforced to support the new living spaces. Yes, spaces. The homeowners now have an expansive screened porch and open deck – all low-maintenance! 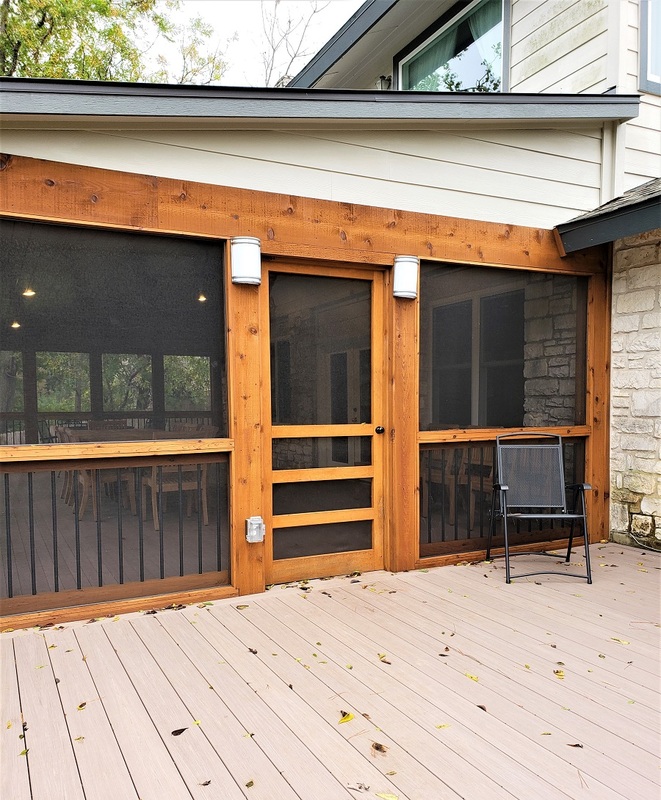 We are your trusted Austin screened porch builder. — Award-winning screened porch and deck design in Austin, TX. The porch and deck flooring in these beautiful outdoor living spaces were both created with AZEK porch plank, a tongue and groove system, that fits together tightly – no deck board gaps! The Silver Oak finish is the perfect complement to both the existing home’s exterior stone and siding, and contrasting color to the rich cedar framing of the screened porch. Matching AZEK materials can be found on the new low-maintenance stair, as well as the fascia of the entire structure. Finished fascia is a hallmark of true custom-finished touches provided by Archadeck of Austin. — Gorgeous cedar screened porch with low-maintenance AZEK fascia board. The low-maintenance stairs boast Fortress railings in sand black with robust 3” posts. These low-maintenance finishes add a shiny and new element to the existing stone columns underneath the porch and deck – a perfect marriage of new and existing materials. Archadeck of Austin was even able to match the original stone to re-create new columns that were necessary. 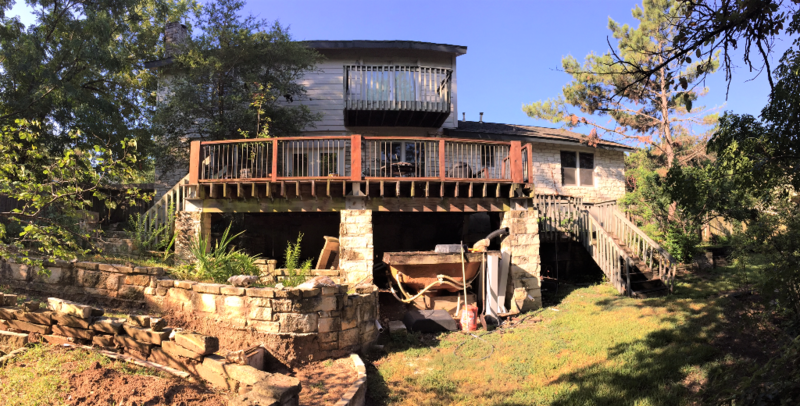 — AZEK porch plank deck and Fortress railing in Great Hills – Austin, TX. — Low-maintenance AZEK stair in Silver Oak with Fortress railing in Great Hills. Let’s see the inside of this fabulous Austin TX screened porch! The interior of this screened porch is truly stunning. Talk about a great mix of new and existing materials! The beautiful Synergy tongue and groove ceiling is a flawless addition to this rustic stone. The rich Auburn color is a beautiful match to the cedar finish, and a wonderful display of material expanse made even better with custom ceiling fans and recessed lighting. We can almost feel the breezes produced by these fans in the space! 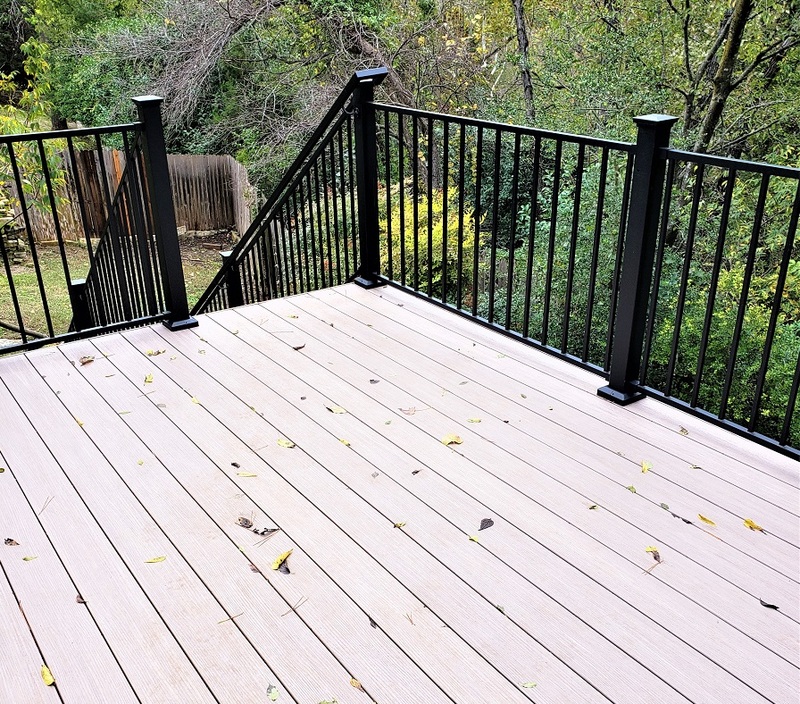 Archadeck of Austin added a built-in baluster inside the screened porch. The screens are attached to the exterior of the metal balusters. — Custom built-in balusters by Archadeck of Austin enclose the screened porch. Dramatic change and usable outdoor living spaces. — Original aging deck and balcony. The importance of hiring a professional outdoor living design and build firm for projects like this is not lost on this story. 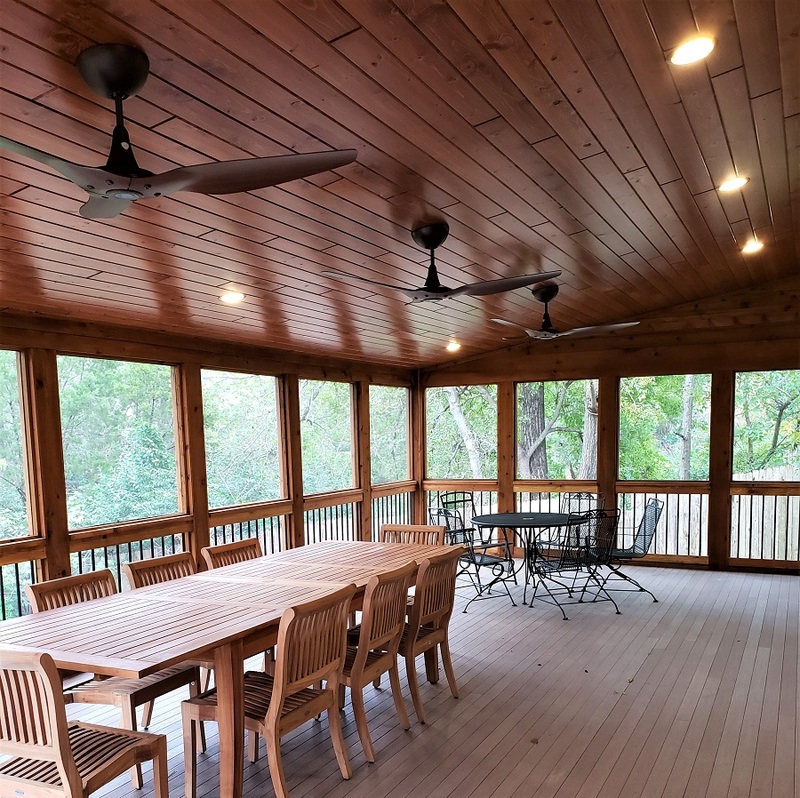 Archadeck of Austin was able to come into the project to gain a true understanding of the homeowners’ outdoor living and design expectations and put them into motion. We have an unmatched understanding of building materials specifically used in outdoor living and can match your intended maintenance level with products that won’t have you performing lengthy annual tasks. We were able to create a dramatic difference for these homeowners, and finally give them the spaces they truly hoped for – beautiful and usable. If you are looking for an outdoor living space that will add true functionality and beautiful design, call Archadeck of Austin today at 512-259-8282 or email us to schedule your free design consultation.